First and foremost, I would like to thank Assistant Professor Dr. Vu Dinh Hoa for his support and encouragement throughout my studying master at Hanoi National University of Education. I deeply appreciate not only his intelligence, knowledge, and willingness to provide guidance for my thesis, but also his sense of humor and his enthusiasm. Grateful acknowledgements are addressed to Mr. Do Trung Kien, Mr. Nguyen Huu Xuan Truong, Mr. Pham Thi Lan and other members of the seminar Computer Science for their valuable and constructive comments on this thesis. I wish to express my gratitude to all teachers, staffs at Hanoi National University of Education for their knowledge, encouragement and support during my study. Thanks to my friends, graduate students, for their encouragement. They also made my time at HNUE an enjoyable experience. The most sincere thanks to my parents who have always been true believers and encouraged me in the past two years. Examination scheduling problems are very common, but very difficult to solve in practice. They are known as constraint optimization problems, NP hard problems, these are concerned with the allocations, subject to constraints of given resources to objects in space and time in such a way as to satisfy a possible set of desirable objectives . Courses will be scheduled to time and classrooms so that lecturers can supervise and students can attend these courses without any conflicts. A large number of researches have been carried out on these problems . The examination scheduling will become more complex in a multiple classes, subjects, classrooms and lecturers, as illustrated in Figure 1-1. So, the number of conflicts about them is creasing more and more. The lecturers may be busy in some differents days, the classrooms are sometime shared between faculties, the classes have the different numbers of students. Each faculty needs its own timetable for its own resources. As a result, many problems still exist in the examination scheduling related to the resources. The examination scheduling itself contains a large number of conflicts and needs a large amount of processing time. This study proposes a hybrid centralized and de-centralized approach and genetic algorithm to the examination scheduling problem in a faculty universities. The proposed approach and the genetic algorithm are used to solve the NP hard problems. The GA is based on the principle of survival of the fittest members of the population to produce the solution. The selected individual according to the fitness level of the problem domain creates the set of solutions. The GA is an iterative process that is repeated until the convergence criterion is satisfied. - To provide a system that helps multiple faculty universities solve their course scheduling problems. - To investigate the use of the proposed GAs to the examination scheduling problem in a faculty universities. Chapter 1: About genetic algorithm. This Chapter introduction to the brief history, some developments of the genetic algorithm, biological basis, the operators, the parameters of the algorithm. More details on the operation selection, coding, crossover and mutation. Help readers have an overview of genetic algorithms. Chapter 2: Examination Scheduling problem is reviewed. This chapter presents the problem NPC - as examination scheduling problem, the problem that required the test as scheduled, and related issues to resolve some problems have made the world today. Help readers better understand the problem that be solved by the thesis. Chapter 3. The application in examination scheduling. This chapter presents an overview of the system, system architecture, user class specification, design database and system functions. 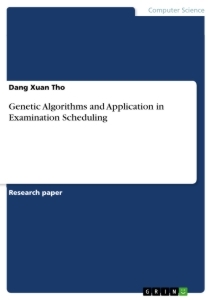 The chapter also describes how specific applications of genetic algorithms to scheduling problems, giving readers detailed information about features, system implementation examination scheduling. Chapter 4. Experimental Results. This chapter summaries the conclusions during the thesis. Giving readers more specific information about the functions has been implemented in the system. Conclusion. Last chapter, this section presents about the conclusions, the limitations and the future development of the thesis. Genetic algorithms are a part of evolutionary computing, which is a rapidly growing area of artificial intelligence. In the 1960s, Rechenberg (1965, 1973) introduced "evolution strategies" ( Evolutionsstrategie in the original German), a method he used to optimize realívalued parameters for devices such as airfoils. This idea was further developed by Schwefel (1975, 1977). Fogel, Owens, and Walsh (1966) developed "evolutionary programming," a technique in which candidate solutions to given tasks were represented as finiteístate machines. Several other people working in the 1950s and the 1960s developed evolutioníinspired algorithms for optimization and machine learning. Box (1957), Friedman (1959), Bledsoe (1961), Bremermann (1962), and Reed, Toombs, and Baricelli (1967) all worked in this area, though their work has been given little or none of the kind of attention or followup that evolution strategies, evolutionary programming, and genetic algorithms have seen. Genetic algorithms (GAs) were invented by John Holland in the 1960s and were developed by Holland and his students and colleagues at the University of Michigan in the 1960s and the 1970s. In the last several years there has been widespread interaction among researchers studying various evolutionary computation methods, and the boundaries between GAs, evolution strategies, evolutionary programming, and other evolutionary approaches have broken down to some extent. Today, researchers often use the term "genetic algorithm" to describe something very far from Holland's original conception. At this point it is useful to formally introduce some of the biological terminology that will be used throughout the thesis. In the context of genetic algorithms, these biological terms are used in the spirit of analogy with real biology, though the entities they refer to are much simpler than the real biological ones. All living organisms consist of cells. In each cell there is the same set of chromosomes . Chromosomes are strings of DNA and serves as a model for the whole organism. A chromosome consist of genes , blocks of DNA. Each gene encodes a particular protein. Basically can be said, that each gene encodes a trait , for example color of eyes. Possible settings for a trait (e.g. blue, brown) are called alleles . Each gene has its own position in the chromosome. This position is called locus . Complete set of genetic material (all chromosomes) is called genome . Particular set of genes in genome is called genotype . The genotype is with later development after birth base for the organism's phenotype , its physical and mental characteristics, such as eye color, intelligence etc. The fitness of an organism is measured by success of the organism in its life. Algorithm is started with a set of solutions (represented by chromosomes) called population. Solutions from one population are taken and used to form a new population. This is motivated by a hope, that the new population will be better than the old one. Solutions which are selected to form new solutions (offspring) are selected according to their fitness - the more suitable they are the more chances they have to reproduce. This is repeated until some condition (for example number of populations or improvement of the best solution) is satisfied.